On Thursday, June 28, the North Carolina Coastal Federation gave a group of North Carolina Association of County Agricultural Agents (NCACAA) a tour of the living shoreline at the North Carolina Aquarium at Pine Knoll Shores. On this tour, the federation showed the agents one of its living shorelines that is currently being built behind the aquarium. This shoreline will contain Oyster Catcher™ reefs once it is complete. Oyster Catcher™, which was co-created by Dr. Niels Lindquist and Clammerhead of Sandbar Oyster Company, is a biodegradable material that promotes oyster growth because it has been pre-seeded with juvenile oysters. 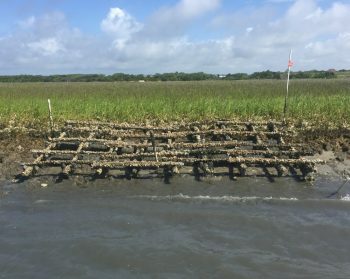 Oyster Catcher™ is currently being tested on Carrot Island to determine if it is better at preventing erosion than the current plastic mesh oyster bag method. Rachel Bisesi, coastal education coordinator at the Ocean office, and Dr. Lexia Weaver, coastal scientist, explained to the group the benefits of building living shorelines as an alternative to bulkheads. Some of these benefits include providing habitat for wildlife, increase water quality and preventing erosion. They also explained how a living shoreline is built and gave the group a quick demonstration on planting salt marsh grasses. The group also spent some time in the salt marsh exploring and searching for coastal wildlife. 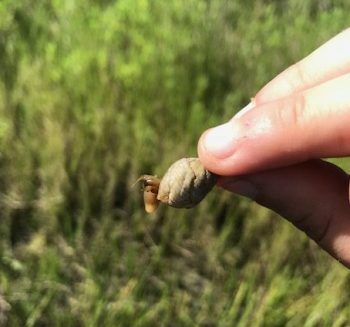 Agents were able to see fiddler crabs, periwinkle snails, hermit crabs, clams and several small fish. Being agricultural agents, they were also interested in the types of plants that grew along the marsh. One of the plants they learned about was “pickleweed,” some of the members in the group even tasted it as it is an edible salt-tolerant plant. While the trip was just a short tour, this group spent a great deal of time not only learning about living shorelines, but were able to immerse themselves in a living shoreline habitat and see all the benefits firsthand. For more information about living shorelines visit nccoast.org/livingshorelines or the Living Shorelines Academy. The Living Shorelines Academy provides information that encourages the use of living shorelines as an erosion control practice.